Design isn't as subjective as people think and with good data you can make (and defend) great design. Most of the time I write about how good design can improve our ability to work with data but today I'm writing about the opposite. 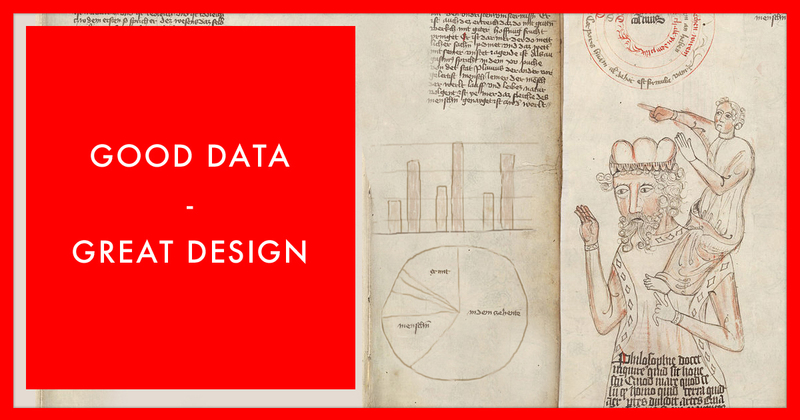 This post is about how good data can help make great design. UX designers have access to a variety of data sources that can help make smarter design decisions. The first source is usability testing. Usability testing evaluates a website/app and observes whether or not users can complete the intended tasks, what their emotional responses to a design may be, etc. With just a few users you can find the majority of what is/isn't working and make changes accordingly. There are a variety of methods for usability testing, from the expensive to the cheap, but all provide some benefit. You can even remotely test users from around the world, online, without ever leaving your office. Most of the time we talk about what is broken in usability testing and how it should be fixed but knowing what is working can be just as useful as knowing what isn't working. When you have data to back up what works you can defend it when people want to arbitrarily change it. Knowing that some aspect of a design really resonates with users, and having data to support that claim, is incredibly valuable when justifying your design decisions. A second source of data for designers is web analytics. Google Analytics (GA) data is a great resource to understand the usage of your site/app as well as a bit more about who your users are. You can learn what browsers your users use, what device types (tablets, laptops, smartphones, etc.) they are accessing your content on, where in the world they are, etc. Just recently I was asked what the latest base-line monitor resolution is to design for. Armed with GA data from our own site, as well external studies, I could confidently say that the former design standard of 1024x768 has been replaced by the wider 1366x764. This wasn't a guess, or a hunch, but an informed design direction based on data. A third source of data is the UX community. By "standing on the shoulders of giants" you can use existing research, best practices, and design standards to make smarter decisions. You can build off of the progress of others. To use another idiom, "reinventing the wheel" can be a waste of time and not all design decisions need to be groundbreaking. Sometimes the road less traveled is less traveled for a reason. Having said all of this, it is important to remember that you shouldn't blindly follow data. I've written about data-informed decision making before. The best approach is to blend your own experience & common sense with the data to make the best decisions. User feedback, usability studies, and website analytics can all be flawed in their own ways and ultimately you need to determine the best course of action while accounting for this. Data literacy is a skill set that all designers would be better served to develop.